Description: Black tank/caterpillar treads (measures 14" long, although the treads make a circle, 1-1/8" wide). Description: Black rubber tires that attach to the connector pulleys that double as wheels (measures 1-3/4" diameter, 3/8" thick). The tire has a raised "Fisher-Price" imprint on the side. Description: Wide black rubber tire that can be attached to a wide wheel (measures 1-3/4" diameter, 1-3/8" thick). Description: Black wheel/axle with 2 wheels and a round connector bar between the wheels. Measures 15/16" diameter x 1-1/4" wide. Description: Clear plastic tire that attach to a connector pulleys that double as wheels (measures 1-3/4" diameter, 3/8" thick). The tire has a raised "Fisher-Price" imprint on the side. Description: Military green round wheel assembly with a connector molded onto one side (measures 15/16", diameter, 9/16" high). Description: Small round military green pully (measures 15/16" diameter, 3/8" thick). The disk has a hole in the center and a slit on the side from the center hole to the outeredge. Description: Small round hot pink pulley/wheel. There is a hole in the center of the pulley with a small triangular peg on one side of the hole (measure 7/8" diameter, 3/16" thick). Fits: #6203 Construx Alien Series "Terrordrone" (1987-1988) - ??? Description: Wide round silver wheel (measure 1-3/4" wide, 1-1/2" diameter). Description: Large round silver pulley/wheel. One side of the pulley is flat and smooth. The other side has a round raised cylinder around the center hole. 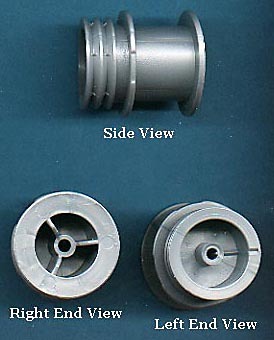 The pulley has a connector-shaped hole on each side of the center hole (measures 1-7/8" diameter). Description: Small round silver pulley/wheel. There is a hole in the center of the pulley with a small triangular peg on one side of the hole (measure 7/8" diameter, 3/16" thick). Description: White Glow-In-The-Dark wheel assembly with a connector molded onto one side (measures 15/16", diameter, 9/16" high). Description: Yellow wheel assembly with a connector molded onto one side (measures 15/16", diameter, 9/16" high). Description: Small round yellow pully (measures 15/16" diameter, 3/8" thick). The disk has a hole in the center and a slit on the side from the center hole to the outeredge. 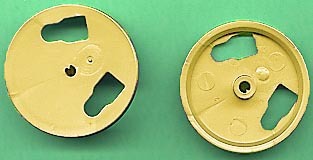 Description: Small round yellow pulley/wheel. There is a hole in the center of the pulley with a small triangular peg on one side of the hole (measure 7/8" diameter, 3/16" thick). Description: Wide yellow wheel (measure 1-3/4" wide, 1-1/2" diameter). Description: Large round yellow pulley/wheel. One side of the pulley is flat and smooth. The other side has a round raised cylinder around the center hole. 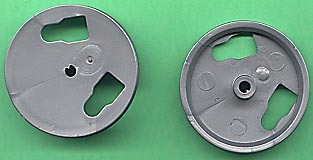 The pulley has a connector-shaped hole on each side of the center hole (measures 1-7/8" diameter).